CWMDU. Many people can't spell it, even more can't pronounce it and more still don't know where it is! The village really hasn't changed much in the past century, and is still just a group of cottages stretching for some 200 metres on either side of the road. Leaving Abergavenny and heading West on the A40 towards Brecon, after passing through Crickhowell, the A479 turning is approached on the right. This single carriage way road, only 12 miles long in total takes you through some fabulous scenery with the Black Mountains on your right and the Brecon Beacons on your left. It passes through Talgarth and Bronllys and eventually joins the A470 Brecon to Builth Wells road at Lyswen, a well worth while trip if you can make the time to enjoy it. 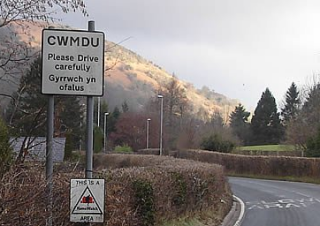 Just three miles into this journey you will have arrived at Cwmdu and if you see the Village Hall on your left you will already have missed the village itself! In the late Autumn of 1959, after harvest, a group of like minded locals met over some beers and formed the CWMDU CAR CLUB. The first race meeting was held very near by on WHIT MONDAY (now spring bank holiday) 1960 at Cwmdu, then in the county of Brecknockshire. A bank holiday Monday was chosen because it was not the "done thing" to hold this type of event on a Sunday! Looking at the nearby fields which were available it would be hard to choose one which would accommodate the pits at a modern day event, let alone the whole race meeting! From 1960 to 1965 the Club continued to race as an independent Club, until it became a founder member of the WESTERN GRASS TRACK CAR RACING ASSOCIATION in 1966. In 1970 the BRITISH JALOPY RACING ASSOCIATION (BJRA) was formed and Cwmdu actually hosted in 1973, the last National BJRA Championships. The event that year was held at Hampton Bishop under the leadership of Mr Don Page, one of the longest serving Cwmdu Chairmen in the Club's history. Some famous names collected National Championship wins with Cwmdu during the BJRA days, including C22 Don Jenkins, C44 Terry Brown and in the ladies class C44 Heulwen Brown. 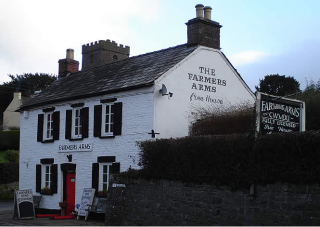 During this time the club held its monthly meetings at the Herbert Arms, on the Abergavenny to Monmouth road, followed by the Tram Inn, just off the A465 Abergavenny to Hereford road near Allensmore. The Temple Bar, Ewyas Harold was our home from 1988 and we now can be found at The Tump Inn, Wormelow on the first Wednesday of every month. Before the start of the 1974 season, NASA, as we now know it had been formed and the Cwmdu Jalopy Club changed its name to the Cwmdu Car Club which also became part of the WEST MIDLAND LEAGUE. Interestingly, the Cwmdu Car Club was probably the first and is still amongst only a handful of NASA Clubs, not to have the word Autograss in its Club title!